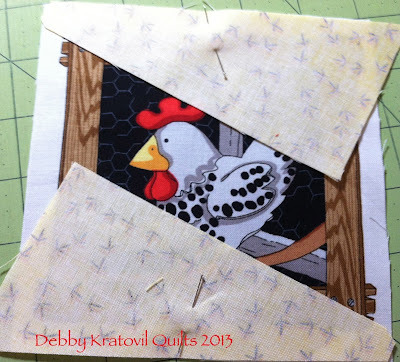 Today our Featured Designer for Technique Tuesday is Debby Kratovil and she is working with Fowl Play by Kanvas. 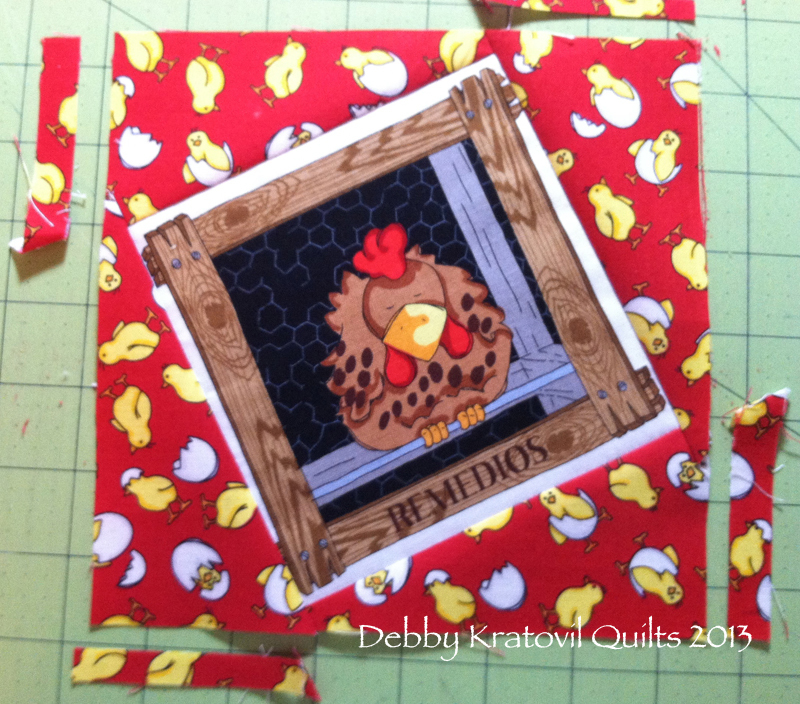 These fabrics are based on a real life urban chicken farm (the names of the chickens are real! ), so that really gives personality to the whimsical prints of chicks, hens, chicken wire and even chicken scratching! Pop on over to our Facebook page to see the entire Fowl Play collection. Debby, why did you choose this particular collection to work with? How could I not? I absolutely love bright prints with good contrast. 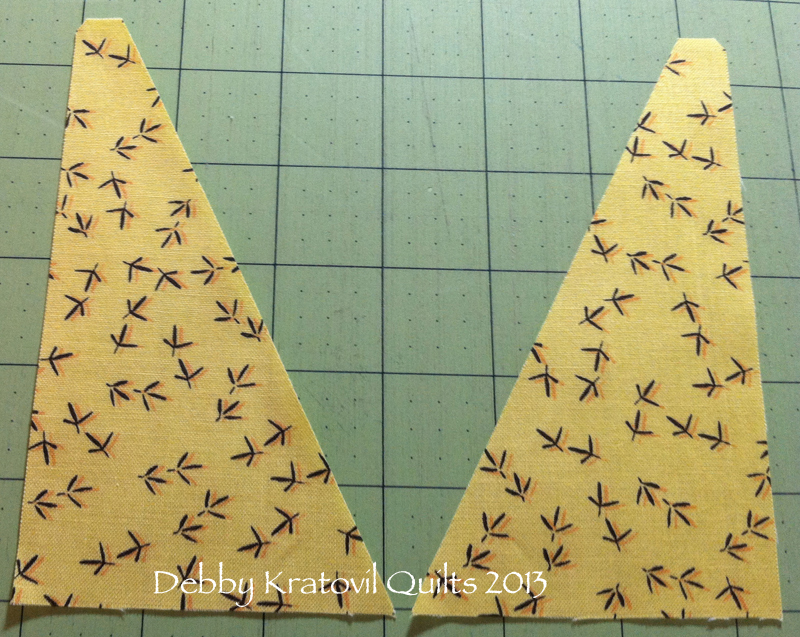 And I so enjoy the challenge of working with panels and fussy cutting motifs so they get center stage. 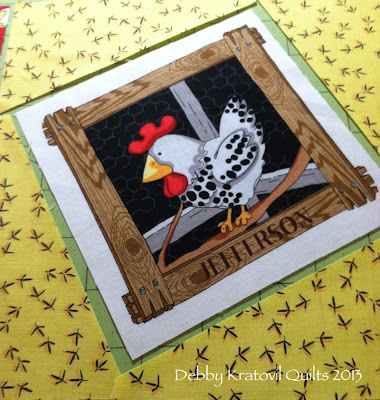 Those panels of chickens have actual names of real birds from a real farm. How could I resist? How did you decide on a project? What is your process for making a set of blocks into a quilt or other project? I always listen to the fabrics. Once they come into my home and I've folded and stacked them, they begin to get comfortable enough to start giving me ideas. Like I said, I always love the challenge of working with panel prints. I love to get them centered into a block, but not a boring block. The block I share today is my Tilt Block. I began making this around 2001 when I bought Darlene Zimmerman's Tri Recs tools. Rather than bore you with words, let my photos do the talking. 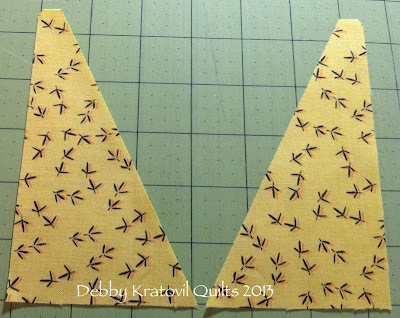 Why did I use the Tri Recs tool and not just cut oversized squares or triangles? Because using this type of triangle, the outside edges of all four sides stay on the straight of grain. NO BIAS EDGES. The angle of the Tri Recs tool is about 57-1/2 degrees (I think), so I had to guess the height of the triangle to use to "tilt" my block. Not to worry; because we will eventually shave a little off the overhanging edges, this will be fine. I fussy cut the panels into 5-1/2" squares. Then I audition my triangles to make sure I've got them in the right position. this block is such fun and now you have given me more ideas foe using the tri rec tool which just sits in a bag at the moment. I am soooo totally in love with this...Debby what a delightful quilt, love the colours, your tut is excellent....wow! Love this chicken fabric and the happy feet print - too cute. I hope my LQS gets this in. 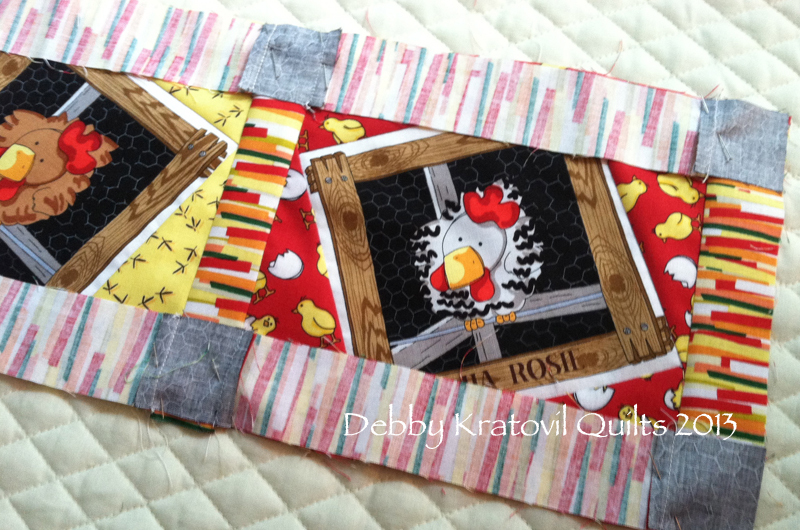 Cute table runner - thanks Debby. Thanks Debby! I just bought that ruler, so I love seeing another project to use with it!! Great project! 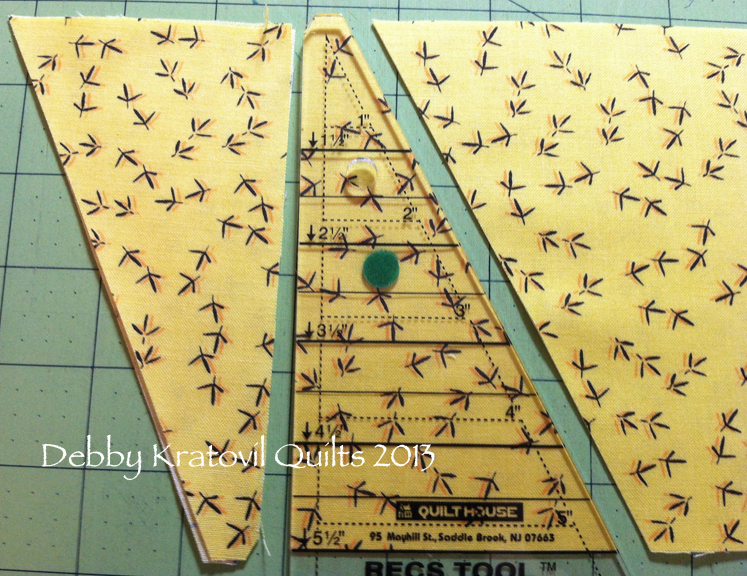 I LOVE the cute fabrics and the wonderful thought of no bias edges when using the Tri Recs ruler. Can I just say that I think you're a genius! 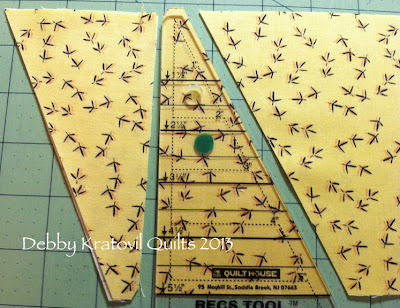 I've always liked the tilted block look but didn't like the wasted fabric and the outside grain on the bias...and I never even thought about my tri-recs ruler! Guess what I'll be playing with soon! Thanks! So cute, and yes, great use of Tri Recs to get the tilt! This is so cute. And funny enough, I just got the tri tools in the mail and was wondering what the half one would be used for. I love tilted blocks, this tutorial came at the perfect time, thanks! 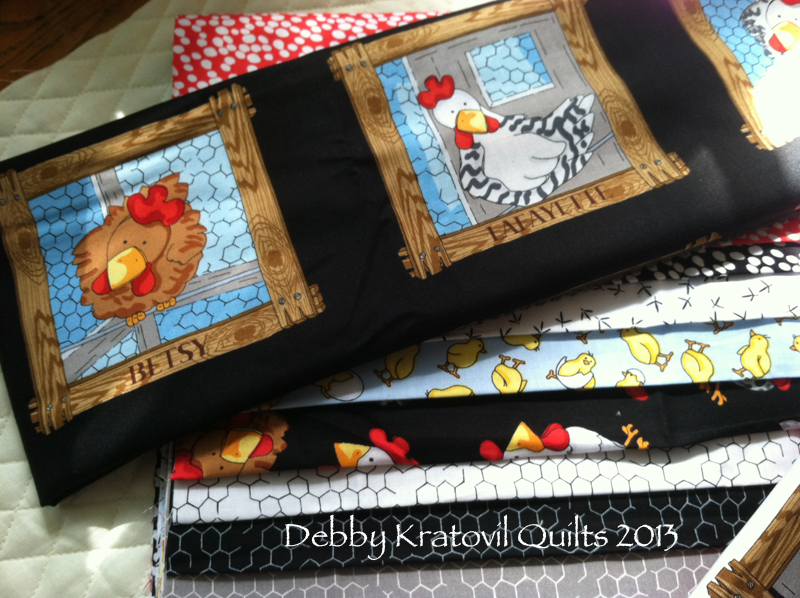 Such a fun collection of fabric! OMG!!! This fabric line is awesome!!! Love it!! I have had the tri-recs ruler for years - it is still in the shrink wrap!!! Now I have found a use for it. Great tutorial - thank you. Cute project, I have a tri recs ruler so I'll have to try this out, love the fabrics too. 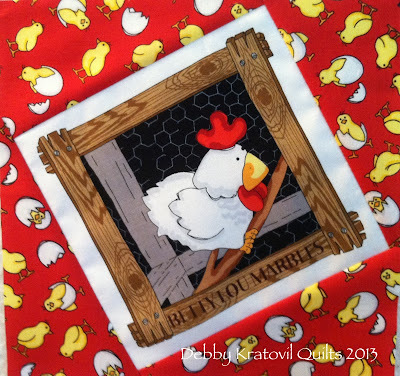 Adorable fabric and very cute project!! How much fun that is! I will have to look for those fabrics, though it would be cute in any focus print. This is too cute! Love the chicken blocks set this way. I have some other novelty fabrics I think this technique will work with, so I am going to have to give it a try! 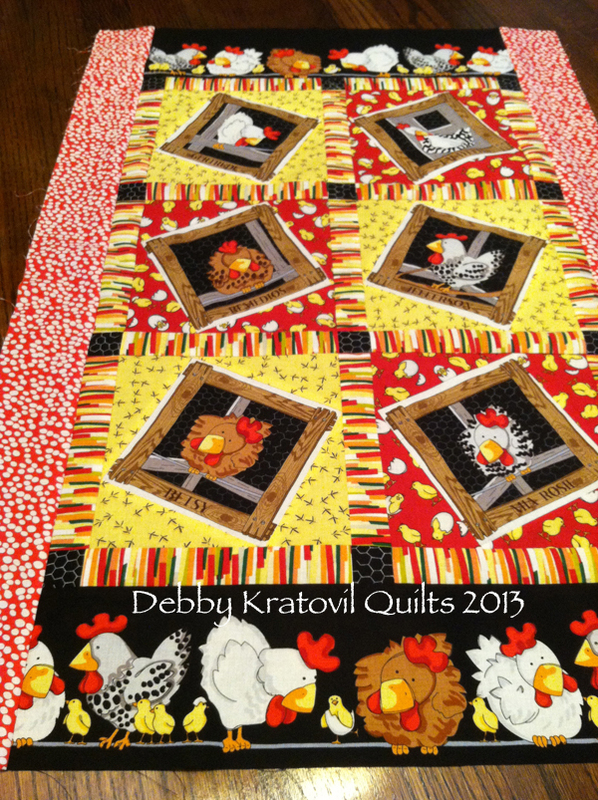 I love the idea of this quilt, and especially love the fabric. Does anyone know where I could get the fabric? 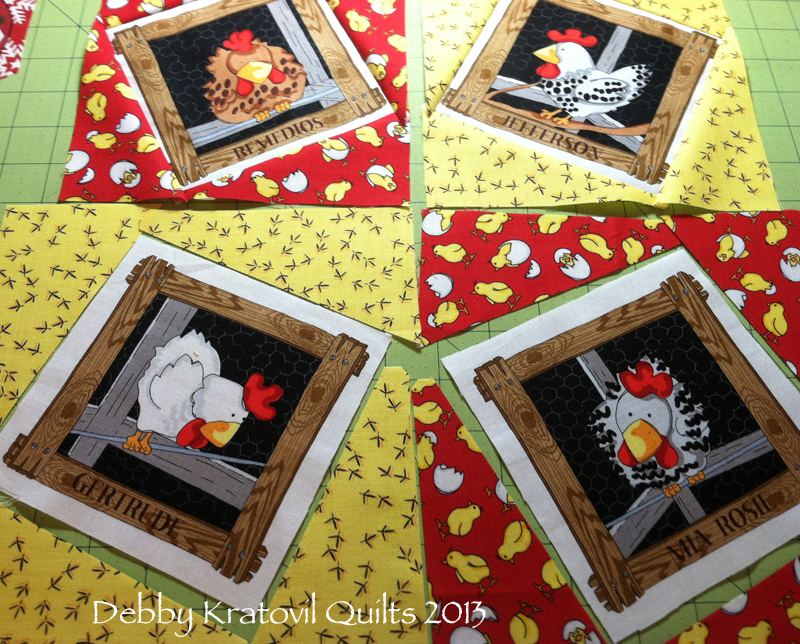 I quilt with 2 ladies that raise chickens and we would love to make this quilt....and these cute chickies remind me of their chickens. 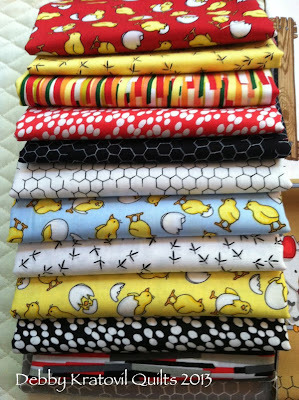 Hi Amy, if you do a google search on "fowl play" fabric, you should find some options. Good luck! 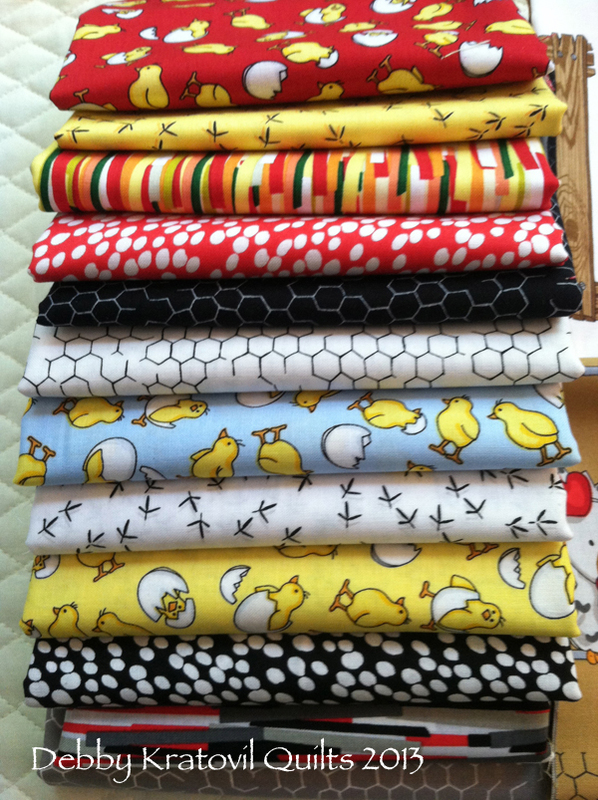 These fabrics are absolutely adorable! And your quilt is so darn cute! Love it so much! Now, I have to hunt down for this fabric. 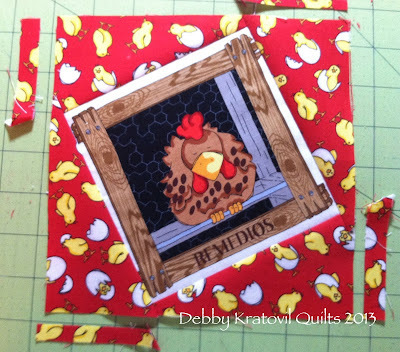 Thank you Debbie - I have been struggling to make tilted blocks for some "Maxine" panels - your idea is Perfect!